The Raval area in general is, little by little, being polished up (i.e. 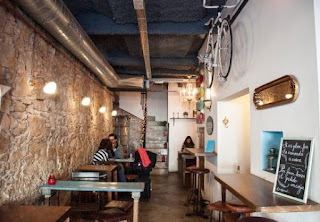 gentrified) so if you fancy a journey into one of the older and seedier parts of the city you could do a lot worse than to visit the main 'Rambla de Raval' where this bar is located. If a lively atmosphere, kicking tunes and comfy sofas are your bag, this place will sit comfortably in your bar visiting itinerary. Although you might be a little overwhelmed by the 'sardine can' dimensions of this locale - once you manage to fight your way to the bar and grab a handful of drinks, it's fairly comfortable as long as you can jostle your way to a table. For this reason, try and get here before the main rush after midnight and most likely it's a bar to idle away your evening in. However having said that there are also many other bars in this rather bohemian local 'high' street so either way you can pass your night in to semi-oblivion in Raval 32 or for those with a sense of adventure, include it on your back street, maze like drinking crawl. Recommended for those who wanna get off the cheesy tourist track! 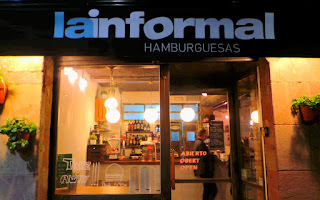 Update 2018 - Raval 32 has now been converted to a "hamburguesería", but of the artisan kind, not the fast-food type. Beer and gourmet burgers are always an excellent mix when you're looking for something a little more substantial than tapas. It has largely kept it's original kitsch, almost rustic chilled décor, and since you can still get a beer here we've decided to keep it in drinkBarcelona.